Being into health & fitness, I am always looking for new ways to add more protein to my diet. I recently jumped on the quinoa bandwagon and I'll admit I'm loving it. As you may know, quinoa is an ancient grain that contains eight grams of protein per cup and all nine essential amino acids. Eating quinoa before or after a workout is good for energy & muscle repair. One way I've been enjoying quinoa is combed with baby spinach and Barlean's flax-chia-coconut blend. Formed into patties and lightly fried, this combination is a great way to get an extra nutritional boost. The Barlean's mix not only fuels the body but also supports digestive health and tastes great. 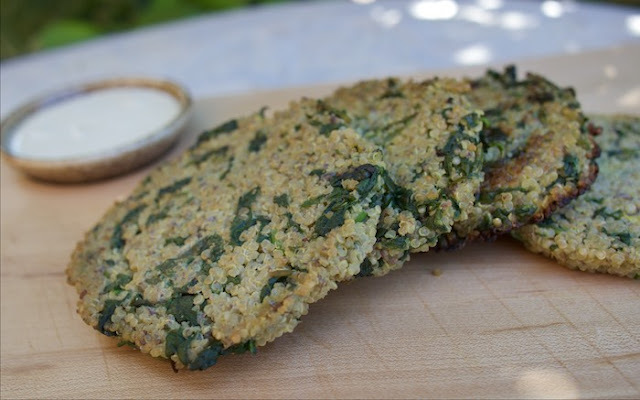 Although these healthy quinoa cakes taste great on their own I enjoy them best with a Dijon yogurt dipping sauce. Heat the coconut oil in a large skillet over medium heat. Add the spinach, eggs, quinoa and flax chia mix to a medium-size bowl. Mix well and let it sit for a few minutes to blend the flavors. Form quinoa patties and place in skillet, in batches if necessary. Cook the patties until they’re browned on the outside, 4 to 5 minutes per side, and then flip. Serve warm with Dijon Yogurt Sauce. Mix ingredients in a small bowl and season with salt & pepper to taste. I love anything dijon! Such a great flavor! I love quinoa and spinach together. That dijon sauce sounds like a great addition too! I need to start eating more quinoa! I love that you're using Barleans! That company is in Ferndale Washington. Thats where I live. Us locals love Barleans! i'm using their digestive blend right now. I'll have to find the Flax Chia Coconut blend and try it out. This recipe looks so good! Perfect for our spring spinach. It's almost ready! Thanks for sharing! Love the idea of making quinoa cakes! I need to try this! These are so up my alley! I love making quinoa cakes! I discovered I like quinoa recently too! Love it! This sounds great! I love easy and healthy recipes like this and the dip sounds perfect. Simple, tasty and nutritious - these sound great! I love the dipping sauce with these. Great idea to cook Quinoa. And i liked dipping sauce too. So easy to make and I bet they freeze well too. Perfect for quick lunches and dinners. Yum, quinoa is the best! These would be great as a healthy snack to take to work too. What a lovely way to use quinoa! I really like using quinoa in recipes. Love the texture and the taste. These look delicious and I just happen to love spinach too. What a cool way to enjoy quinoa! Superfood packed!!! Love the spinach and quinoa combo. I need to try these ASAP! THey look so good and love the quinoa and spinach in them! I'm looking for ways to add more protein to my diet too! It's a big part of my healthy living journey. thank you so much for sharing this delicious, wholesome recipe with us at the Hearth and Soul Hop. Hope to see you again this week!